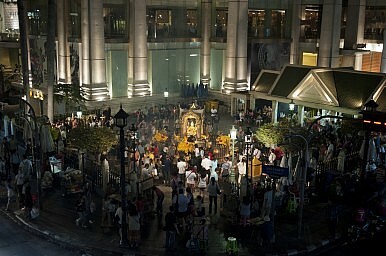 Worshippers at the Erawan Shrine in Bangkok, Thailand at night. According to Police Commissioner General Somyot Poompanmuang, the bomb was planted at the location by suspects who wanted to carry out an attack with mass casualties. “Whoever planted this bomb is cruel and aimed to kill. Planting a bomb there means they want to see a lot of people dead,” he said. Several blasts have rocked the country since the May 2014 coup. The military junta has repeatedly alleged that these are orchestrated efforts to disrupt their rule, while its critics have cautioned that while vigilance is necessary, the government may also be exaggerating the extent of the threat to crack down on its opponents and prolong its reign. In February, The Diplomat reported that Thai Prime Minister Prayuth Chan-o-cha ordered security to be tightened in Bangkok after two bombs were detonated near a luxury shopping mall (See: “Thai Junta Vows Crackdown Following Bomb Blasts”). In March, two men allegedly confessed that “Red Shirt” supporters of the toppled government of former prime minister Yingluck Shinawatra were planning more bomb attacks on up to 100 targets in Bangkok (See: “100 More Bomb Blasts Planned in Thailand, Police Told”). Monday’s blast appears to be the deadliest of the post-coup attacks thus far, just as pressure has been mounting on the junta to get the country’s economy in order and hold a much-delayed election to restore democracy. Thailand’s defense minister Prawit Wongsuwan said that the attacks were not only meant to inflict mass casualties, but were clearly intended to destroy the country’s economy and tourist industry. Though Thailand’s tourism sector is a key growth driver – accounting for around 10 percent of its gross domestic product (GDP) – tourism arrivals took a hit for much of last year due to political unrest. “The perpetrators intended to destroy the economy and tourism, because the incident occurred in the heart of the tourism district,” Prawit told Reuters. Prime Minister Prayuth Chan-o-cha told The Nation television channel that the government would set up a “war room” to coordinate its response to the blast. No groups have claimed responsibility for the attacks thus far, and it would be premature to assign blame so soon after the attack even though some reports have already begun to suggest potential links. In its report, Reuters mentions that initial suspicion may fall on Muslim separatists in the south of the country who have been waging an insurgency against the government which has waxed and waned for decades. Yet as I have noted before, the deadly Southern Thailand insurgency has remained mostly local since its reemergence in 2004 (See: “More Than Words Needed on Southern Thailand”). Some officials have already begun claiming that this may be orchestrated by opponents of the government. Going beyond Prawit, defense spokesman Kongcheep Tantrawanich said the bombing was “the work of those who have lost political interests and want to destroy the ‘happy time’ of Thai people.” While this may eventually be proven to be true, observers should also be cautious about pointing fingers so definitively on one side given the deep political divide in the country. The move aims to quell growing economic anxieties. Interview: Analyzing Thailand’s Erawan Shrine Bomb BlastWill Thailand's Military Be Held Accountable for the Country's Economic Woes?Can Thailand's Junta Reverse its Economic Decline?Thailand Cuts 2015 Economic Growth ForecastWho Will Claim Responsibility for the Recent Bangkok Bombing?